جیوه از خطرناک‌ترین فلزات سنگین شناخته‌شده است که برای انسان‌، حیوان و محیط‌ زیست بسیار خطرناک است. عوامل مختلفی ازجمله پساب کارخانه‌ها موجب افزایش مقدار جیوه در آب شده است، با توجه به مضرات جیوه، توسعه روش‌هایی نوینی مبنی بر حذف این فلز در منابع آب آلوده بسیار قابل اهمیت است. یکی از روش‌های متداول برای حذف فلزات سنگین از آب‌، استفاده از نانو لوله‌های کربنی به‌عنوان جاذب است. در دهه‌های اخیر کاربرد نانو فناوری در تصفیه‌ آلاینده‌ها با توجه به سهولت و اقتصادی بودن، در مقایسه با روش‌های شیمیایی و بیولوژیکی متداول توسعه بیشتری یافته است. نانولوله‌های کربنی به‌‌علت خواص ویژه متمایز از سایر مواد کربنی و نانو ذرات، در بسیاری پژوهش‌ها مورد توجه قرار گرفته‌اند. هدف این پژوهش، یافتن شرایط بهینه برای حذف فلز جیوه توسط نانو لوله‌های کربنی چند جداره عامل‌دار شده با تریس (٢-آمینواتیل) آمین و ارائه نتایج و استفاده از آن‌ها به‌منظور گسترش روش حذف آلاینده جیوه موجود در آب و پساب می‌باشد. نانولوله‌های کربنی چند دیواره با روش رسوب بخار شیمیایی توسط دستگاه طراحی و ساخته ‌شده در آزمایشگاه، تولید و خالص‌سازی شدند و سپس با تریس (2-آمینواتیل) آمین عامل‌دار شدند. پس از این عمل نانولوله‌های کربنی چند دیواره عامل‌دار شده با تریس (2-آمینواتیل) آمین تهیه‌شده توسط طیف‌سنجی تبدیل فوریه مادون‌قرمز، رامان، تجزیه حرارتی وزن‌سنجی، میکروسکوپ الکترونی و آنالیز عنصری مورد بررسی قرار گرفتند. جذب یون‌های جیوه از آب با استفاده از این نانولوله‌های کربنی چند دیواره عامل‌دار شده صورت گرفت و میزان جذب جیوه در نمونه‌ها با استفاده از روش ICP (induced coupled plasma) اندازه‌گیری شد. تأثیر عواملی مثل تغییرات pH، غلظت محلول اولیه، وزن جاذب و زمان تماس با استفاده از سیستم ناپیوسته بر میزان جذب بررسی شد. نتایج به‌دست آمده نشان داد که حذف یون‌های جیوه به‌شدت به میزان pH وابسته است. 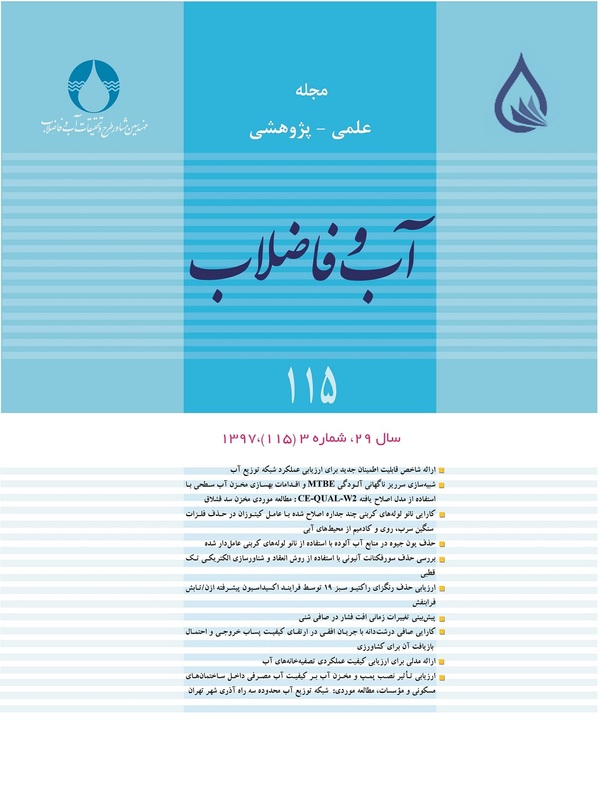 بیشینه ظرفیت جذب مربوط به جاذب تحت شرایط بهینه برای یون‌های جیوه برابر 115 میلی‌‌گرم در گرم به‌دست آمد. اطلاعات به‌دست‌آمده، با همدماهای جذب لانگمیر و فروندلیچ انطباق داده شد. بهترین بازده جذب نیز برابر 1±95 به‌دست آمد. نتایج این پژوهش به‌طور خلاصه نشان داد که حذف جیوه از منابع آب الوده توسط نانولوله‌های کربنی چند دیواره عامل‌دار شده با تریس (٢-آمینواتیل) امکان پذیر می‌باشد. Mercury is one of the heavy metals that is toxic to humans, animals and the environment. The contribution of mercury in the water resources are from various sources including the discharge from industry and municipal wastewater. Hence, removal of mercury from water resources, especially for human consumption, is extreamely important. The removal of mercury is usually accomplished through adsoption and one method is through use of carbon nanotubes as the absorbent. The available commercial nanotubes are often synthesized by chemical vapor deposition which is done easily in an industrial scale. The aim of this research was to find an optimum condition to remove mercury from water by using a multi walled carbon nanotubes modified with Tris (2- aminoethyl) amine. To accomplish the main objective of the study, multi walled carbon nanotubes were machined in laboratory with chemical vapor deposition and later modified with Tris (2-aminoethyl) amine. These multi walled nanotubes then used to absorb mercury ions in water and the amount of absorption measured by induced coupled plasma (ICP). The nanoparticles in this study were analyzed by FT-IR, Raman, TG-DTA, SEM, and EATo evaluate the optimum adsorption for the removal of mercury, several influencing factors such as pH fluctuations, concentration of the initial mercury in solution, absorbent weight, and contact time were investigated. The results obtained from this study conformed mercury adsorption to Langmuir and Freundlich Isotherms. The removal of mercury ions drastically increased with the increase in pH. The optimum adsorption capacity was 115 mg/g and the highest absorption yield was 95± 1. In summary, based on the limited results obtained from this study, it is fair to conclude that the MW-CNT modified with Tris (2-aminoethyl) amine is a useful method for the removal of mercury from water. Anagnostopoulos, V.A., Manariotis, I.D., Karapanagioti, H.K. & Chrysikopoulos, C.V., 2012, "Removal of mercury from aqueous solutions by malt spent rootlets", Chemical Engineering Journal, 213, 135-141. Vijayaraghavan, K. & Yun,Y-S., 2008, "Bacterial biosorptions and biosorption", BiotechnolAdvances, 26(3), 266-291. Dumitrescu, I., Unwin, P.R. & Macpherson, J.V., 2009, "Electrochemistry at carbon nanotubes: Perspective and issues", Chemical Communications, 45, 6886-6892. Duesberg, G. S., Burghard, M., Muster, J., Philipp, G. & Roth, S., 1998, "Separation of carbon nanotubes by size exclusion chromatography", Chemical Communications, 3, 435-447. Ebbesen, T. W., Ajayan, P.M., Hiura, H. & Tanigaki, K, 1994, "Purification of carbon nanotubes", Nature, 367, 519-537. Ghodbane, I. & Hamdaoui, O., 2008, "Removal of mercury(II) from aqueous media using eucalyptus bark: Kinetic and equilibrium studies", Journal of Hazardous Materials, 160 (2), 301-309. Hou, P. X., Liu, C., Tong, Y., Xu, S. T., Liu, M. & Cheng, H. M., 2001, "Purification of single-walled carbon nanotubes synthesized by the hydrogen arc discharge method", Journal of Materials Research, 16(9), 2526-2534. Jimenez-Jimenez, J., Algarra, M., Rodriguez-Castellon, E. Jimenez-Lopez, A. & Esteves da Silva, J.C.G., 2011, "Hybrid porous phosphate heterostructures as adsorbents of Hg(II) and Ni(II) from industrial sewage", Journal of Hazardous Materials, 190 (1), 694-699. Liu, M., Hou, L., Xi, B., Zhao, Y. & Xia, X., 2013, "Synthesis, characterization, and mercury adsorption properties of hybrid mesoporous aluminosilicate sieve prepared with fly ash", Applied Surface Science, 273 (100), 706-716. Meyyappan, M., 2005, "In growth: CVD and PECVD, carbon nanotubes", In: Science and applications, (Meyyappan, M. Ed. ), CRC Press, London. Mohamed, A. S., Ghalia A. & Samia, A. K., 2012, "Simultaneous removal of copper(II), lead(II), zinc(II) and cadmium(II) from aqueous solutions by multi-walled carbon nanotubes", Comptes Rendus Chimie,15 (5) 398-408. Moravsky, A. P. Wexler, E. M. & Loutfy, R. O., 2005, "In growth of carbon nanotubes by arc discharge and laser ablation, carbon nanotubes", In: Science and applications, (M. Meyyappan, M. Ed. ), CRC Press, London. Öztürk, A., 2007, "Removal of nickel from aqueous by the bacterium bacillus thuringiensis", Journal of Hazardous Materials, 147(1),518-523. Stobinski, L., Lesiak, B., Kover, L., Toth, J., Biniak, S., Trykowski, G. & Judek, J., 2010, "Multiwall carbon nanotubes purification and oxidation by nitric acid studied by the FTIR and electron spectroscopy methods", Journal of Alloys and Compounds, 501(1), 77-84. Tawabini, B., Al-Khaldi, S., Atieh, M. & Khaled, M., 2010, "Removal of mercury from water by multi-walled carbon nanotubes", Water Science and Technology, 61(3), 591-598. Walters, D. A., Ericson, L. M., Casavant, M. J., Liu, J., Colbert, D. T., Smith, K. A. & Smalley, R. E., 1999, "Elastic strain of freely suspended single wall carbon nanotube ropes", Appl. Phys. Lett., 74(25), 3803-3804. Yu, M. F., Files, B. S., Arepalli, S. & Ruoff, R. S., 2000, "Tensile loading of ropes of single wall carbon nanotubes and their mechanical properties", Physical Review Letters, 84, 5552-5559. Zolfaghari, G., Esmaili-Sari, A., Anbia, M., Younesi, H., Amirmahmoodi, S. & Ghafari-Nazari, A., 2011, "Taguchi optimization approach for Pb(II) and Hg(II) removal from aqueous solutions using modified mesoporous carbon", Journal of Hazardous Materials, 192 (3), 1046-1055. Zang, Z. P., Hu, Z., Li, Z. H., He, Q., Chang, X. & Synthesis, J., 2009, "Characterization and application of ethylenediamine-modified multiwalled carbon nanotubes for selective solid-phase extraction and preconcentration of metal ions", Journal of Hazardous Materials, 172(2) 958-963.